Israel has, yet again, unilaterally reduced the fishing zone in Gaza territorial waters to only six nautical miles, in all of Gaza’s waters, from the northern to the southern parts of the coastal region. Nizar Ayyash, the head of the Palestinian Fishers Syndicate, said the Israeli side has officially informed the Palestinians regarding the unilateral reduction of the fishing zone. He added that the Israeli move was yet another violation to every signed agreement, including all mediated ceasefire deals, and that this significantly impacts the fishers, who are already subject to daily violations. 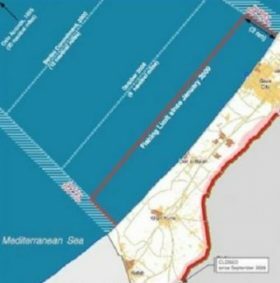 Last March, Israel decided to increase the fishing zone in the area extending from Gaza Valley to the southern part of the coastal region, to nine nautical miles, but kept the zone in northern Gaza at six nautical miles. A week ago, the al-Mezan Center for Human Rights said that Israel carried out at least 17 attacks against Gaza fishers, since the beginning of this year, and kidnapped 65 of them. On Monday morning, a number of armored Israeli military vehicles invaded Palestinian agricultural lands, near Khan Younis city, in the southern part of the Gaza Strip.